“Nona” is a fairly tricky movie, perhaps too much for its own good. Written and directed by Michael Polish, it wants to balance its adoration for its natural locations in Honduras and Mexico with the insidious forces underneath its story of a man and woman traveling to America; it wants to woo viewers and then break their hearts. And while “Nona” does eventually reward audience members with stark drama grounded in a daily nightmare, it risks cheating itself of its full impact, pretending for most of its running time to be a fairytale it certainly is not. The first shot is of a woman (Sulem Calderon) in a darkened room, staring right back at us. She’s holding onto whatever she has left within her. She does not trust us. “What is your name?” she is asked by a voice speaking Spanish, off-camera. No answer. “Where are you from?” the off-screen voice tries again. The woman replies: “San Pedro Sula.” And boom: the film takes us to that Honduran city, through a rush of music and documentary-ready imagery, providing a sense of the location with shots of the peacefulness of the hills, the bustle of the city, and the people who fill it. “Nona” soon evolves into a two-hander travelogue, of Nona and a random handsome man with sharp eyes and a bowler hat named Hecho (Jesy McKinney) traveling toward opportunity: America. In the movie’s way of emotional expediting, they collide in a meet-cute when he almost hits her on his scooter, then have banter over a few brief scenes as he pops up around her, and are soon on their way. He doesn’t have to convince her too much, especially when finding out that all of her close relatives are dead, and that her mother is in America. Nona has a life of dressing up dead bodies, and she reckons that staying in the same place is death itself. She trusts the guy enough, perhaps even more so after he tells her about his broken heart: a Brazilian woman who made him an emotional vagabond. Hecho is not a threat, maybe. Their journey takes them to Mexico, coming across a few friends of Hecho’s who don’t set off any particular alarms or incite interest, and the chemistry between Hecho and Nona as maybe/maybe not romantic is too monotonous. Calderon has a few compelling monologues, about how she preserves bodies, or one in which she imagines her current journey as a fairy tale, but it's only snippets from a character and performance who can grab our attention. And at one point, their journey involving bus after bus leads them to a nice hotel, a trip to a salon, and even a boat ride on their lonesome. Is this like a “Before Sunrise” for young people traveling to to America? Either way, the feelings are weaker than they should be: these passages aren't swoon-worthy, and even though the stark opening interview lingers in the mind, “Nona” is not discomforting. It’s all a bit phony if anything, and you don’t entirely trust that the filmmakers know that. But then a blindfold is put on Nona, sending her through darkness, and us with her. The motivation of the story is soon revealed, and it makes for a shocking third act. In this grand finale, which I am vague about to preserve its impact, we meet characters who are more compelling than anyone before, and are truly immersed in a dark world, captivated in particular by a sequence that involves women dancing to Taylor Swift’s “Shake It Off” being sung in Spanish. This is the true heart of the movie, and yet as insidious as the content is, it provides a backwards type of relief that “Nona” didn’t believe what it was selling either. The last 25 minutes of "Nona" just about justify watching the film even if it could have been a larger proportion of the story. But it comes through a rocky filmmaking experience: scene by scene in this slow-moving tale, “Nona” struggles with a vital balance of Nona’s intimate perspective, and Polish’s desire to create atmosphere with an outsider's eye. The film’s B-roll takes over a larger part of the edit than such observational shots normally do, almost like they have a higher priority than the facade being constructed to trap Nona. 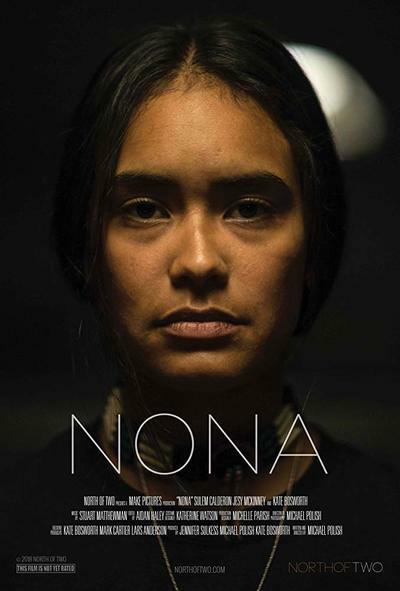 Even though the movie is about Nona, and how thousands of women have experienced her story, it strangely does not feel like it entirely belongs to her.